The past few years I have sold a daily goal tracker download. The purpose is to help you make progress on a daily habit in the coming year. This year I am offering the 2017 daily goal tracker as a free download for newsletter subscribers. I send out a newsletter every two weeks or so. My goal is to keep you updated on shop and product launches but also to highlight fun items or articles I think you might enjoy (sort of like when I used to do weekend links posts on this blog!). If you'd like to sign up for the newsletter you can do so here. After confirming your email address, you'll get a welcome email with a link to download the tracker! Popping in here today to share that the 2016-2017 Get To Work Book, my third round of this product(!) is now for sale and shipping. The new book features an amazing black bookboard cover and I am so happy with how it turned out. Something that I didn't think about when I decided to go all in on a planner business is that I was really setting myself up for seasonal work. It's go-go-go for three months, relax a bit for three months. Go-go-go. Relax. It takes some time to gear up and sink in to BOTH seasons. But it's been so nice. At the risk of sounding like a McDonald's commercial...I'm lovin' it. While I have not been posting here often, I am sharing tons on Instagram! I decided to join #the100dayproject challenge. The goal is to commit to doing something creative everyday for 100 days and share a photo of what you're working on via IG (or I suppose any social platform). Not wanting to physically make anything... we've got a lot going on in this house already, I've decided to share short little pep talks. (See them all so far here.) The flower photo above is from yesterday's (and if you want it as a phone wallpaper, you can download this image right here!). It's my little gentle reminder that when it's starting to pile up (your to-do list, your email inbox, your packing list) the only way to feel better is to start cranking through that work. One to-do list item, one email, one box at a time. If you're interested, you can learn more about the 2016-2017 books and shop other GTWB product - like that GET TO WORK washi tape - here! Through Monday 5/2, all book orders will ship with an exclusive sticker sheet. Two years ago this fall I got it in my head that it would be fun to take everything I have learned about running an online shop and write it down in ebook form. I didn't want to do it alone though and immediately thought about teaming up with Maggie Whitley as a co-author. At the time, we both had online shops. I was selling rubber stamps and a few ecourses and Maggie was selling hand-sewn bags and pouches under her brand, Gussy Sews. Maggie had recently written a month-long series about running a hand-made business that I had completely adored. It felt like we had both taken similar creative paths but done things differently enough that collaborating would make for an interesting book. And today... two years, a couple re-brands, a few pregnancies and 37,000+ words later, we are so excited to (finally!) launch our ebook. It's called Building a Business and we've broken up everything we know into six parts. First we share our background and a bit more about how we got from A to B as online business owners. And from there we expand on what to us feel like the Big Five steps of handmade online business: Dreaming, Planning, Creating, Selling and Sharing. You can see the full chapter breakdown and purchase the 114 page ebook for $12 here. The ebook is formatted in three ways, .pdf, .mobi and .epub so you can print it out or read it through your e-reader or mobile device. Huge thanks to Alexandra Rae Design who formatted our word doc for us and got it ready to roll in all formats. I do hope you'll check it out! Happy Monday! 2016 GET TO WORK BOOK available for pre-order! Hooray! Pre-order for the January - December 2016 version of the GET TO WORK BOOK™ is open. The book features the same simple content designed to organize, not compete with, your great ideas. The book carries the same commitment to keeping things made in the USA. The book has the same awesome (and sharpie friendly!) 100% recycled paper. But it's also sturdier. I have doubled the thickness of the back cover to make it stronger. I am also making sure that all books are machine bound tighter to keep the pressure off that hard-working spiral coil. The final interior design change - aside from dates, of course - is that the monthly tabbed pages open up to the monthly calendar spread instead of gridded pages. Launching with the book is a new snap-in book mark that I am really excited about. I went through many designs before realizing that SIMPLE WINS. With this design, your place is kept but you can see behind it and know what you're working towards any given week. There is also a set of letterpress cards available, featuring 4 of the illustrated designs from the book. These were printed in San Diego and turned out beautiful. Cards come with kraft envelopes. Due to the weight of the book, International shipping is still crazy expensive, but I was able to reduce the ship cost for orders within the US. It's $9 to get your book instead of $11 this time around thanks to USPS re-classifying Priority Mail cubic inch packages (there's a sentence I never thought I would say!). Longest story short: Pre-order your 2016 book here! And don't forget to add on a bookmark! I am so excited for this launch and really appreciate your support. And a ps, for those who ordered the 2015-2016 book, you should have gotten an email from me on Monday with a special customer service offer. Please email me (eliseATgettoworkbook.com) if you did not receive or cannot access this email. 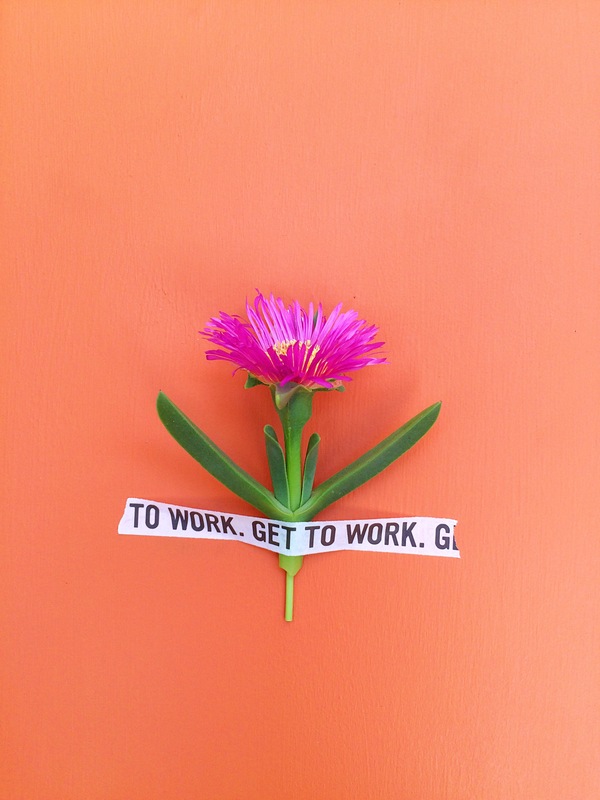 I'm excited to be opening GET TO WORK BOOK™ for pre-order! This has been BY FAR my longest runway to launch but it's also miles more legit than anything I've done. Even the prototype that I shot for this pre-order is amazing. The real book?! It's going to be spectacular. You can head over to gettoworkbook.com to see more photos, watch the 7 minute walk-through video, learn about book specs, see digital page layouts and (if you're into it) order your copy. BONUS : if you pre-order in the first week (through April 8), you'll get a free 5x7 print (shown above) with your book as a special thank you. I am so grateful for your support and excitement for this project so far. It's always amazing to turn an idea into reality but this book there is something extra special about this book and my plans for this new brand. If you're so inclined, I would LOVE it if you shared a link to this post or to gettoworkbook.com with your facebook friends, pinterest followers, twitter audience, linkedin contacts, real life friends(? ), plants, pets and family members. The more eyeballs I get on this, the better. Now GO! GET TO WORK!